Feeling disheartened by the experience, and with Christmas looming, I dug through our box of Christmas ornaments and came up with a red amaryllis fabric flower and some holly leaves and berries that I had bought a couple of years ago to decorate a wreath. I dug around a little more to find the perfect finishing touch. Now the question you might ask yourself when seeing this image – after “Is this the Prynnes’ residence?” – is “Why does that paint color exist… in glossy?! And, why would anyone choose it for their front door?!” . I know. These are questions I ask myself every day as I’m climbing up the five flights of stairs to our home. 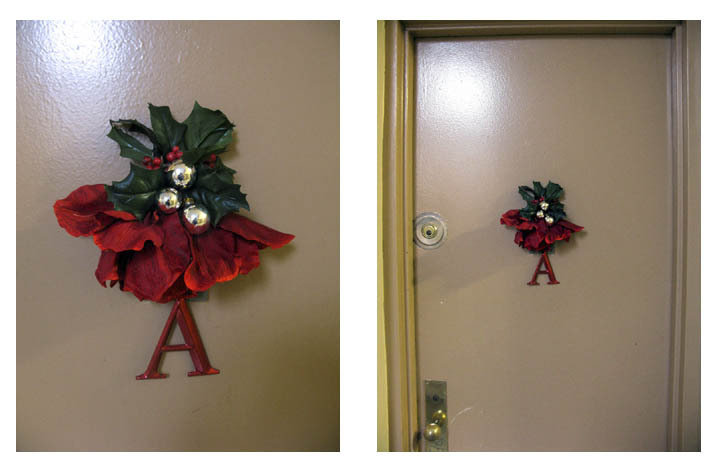 The door color is actually the “accent color” of our building hall and stairwell. The main color that it’s “accenting” is closer to Yarn Harlot’s Saddle Tan. You can see now why I like to liven things up a bit for Christmas. 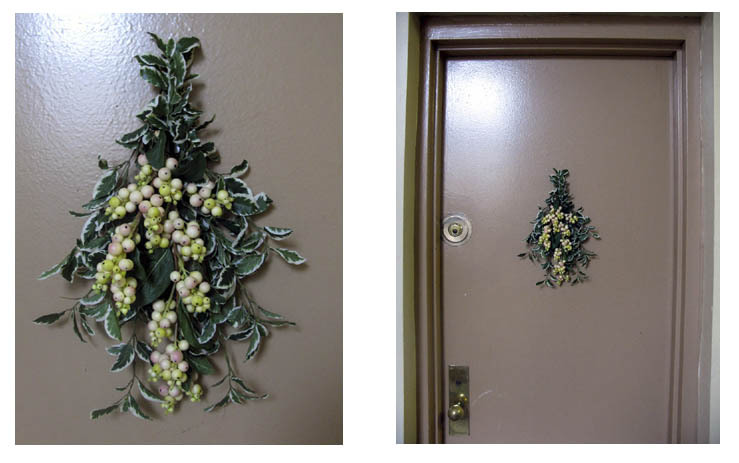 In fact, why should our door should be welcoming and cheerful only at Christmas? So off I went this week to my favorite fabric flower store on 28th Street, Pany Silk, and found a nice combination of flowers and leaves that I wired together to replace the holiday flowers and bring in the new year.